Una Pasión Compartida by Oscar Trejo is a beautifully printed and bound book that any aficionado of classical music in Jalisco would be proud to own. It can be purchased at Librerías Gonvill . 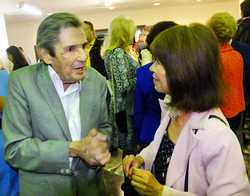 Oscar Trejo autographs books at the Cámera de Comercio auditorium which was filled to overflowing by friends of the Guadalajara Concerts Association. 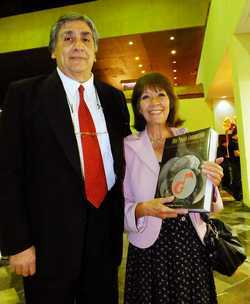 Jaime Álvarez del Castillo Gregory, Director of Editorial Ágata, which published Una Pasión Compartida, with author Susy Pint. 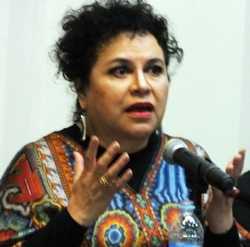 Soprano María Luisa Támez speaks about the untiring efforts of Martha González de Hernández Allende to bring the world's greatest musicians to Jalisco. 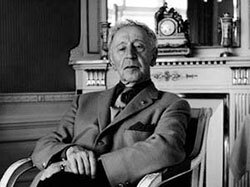 Only with great difficulty did Tere Casillas manage to bring Arthur Rubinstein to Guadalajara. Photo (1963) by Erling Mandelmann, courtesy of Wikipedia. 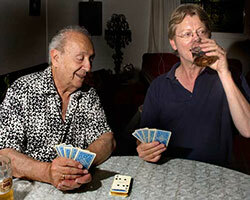 Concertmaster Anshel Brusilow, left, with Violinist Robert Nelson, joking while playing Oh Hell at Rancho Pint. For the story, see Too Much Beethoven. Oscar Trejo with Susy Pint. 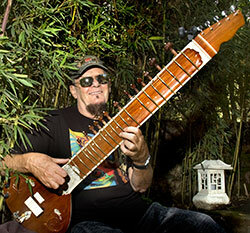 Electronic music pioneer Joel Vandroogenbroeck played at the Degollado in 1996 with maestro José Guadalupe Flores. 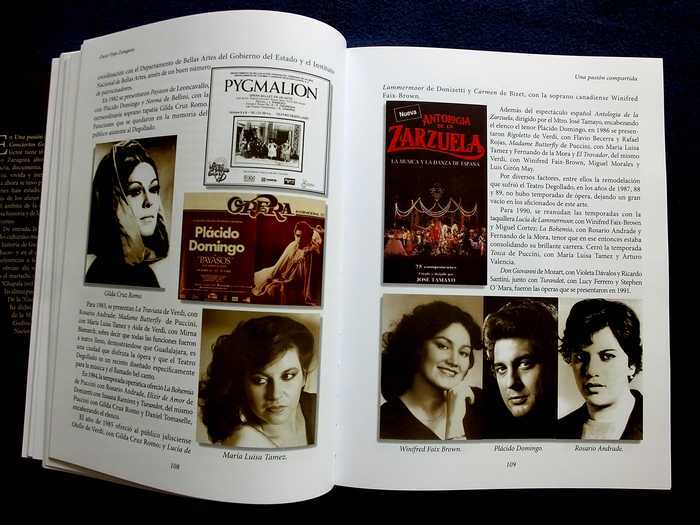 The first 200 pages of this book are filled with nostalgic posters and photos recalling concerts and operas featuring the most famous artists in the world. 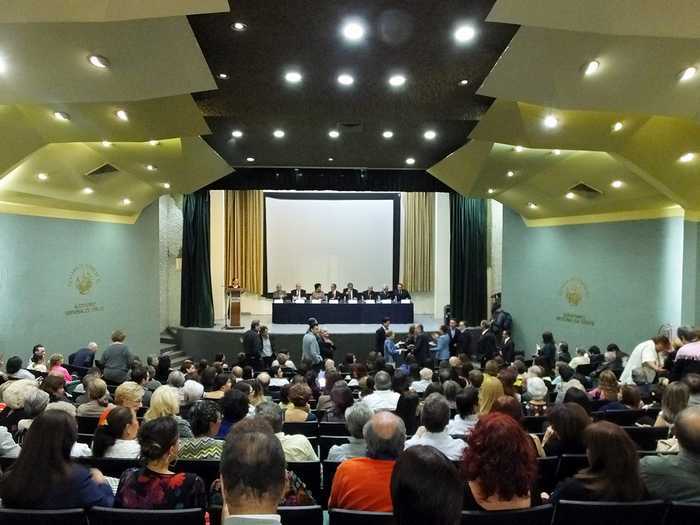 There was standing room only at the Guadalajara Chamber of Commerce auditorium on Friday, March 10, 2017 for the presentation of a book outlining the history and contributions of Conciertos Guadalajara, the organization which—since the founding of the Symphony Orchestra in 1916—has been bringing the world’s most famous soloists to the Degollado Theater and hundreds of other venues in Jalisco. Una Pasión Compartida (A Shared Passion) is a collector’s item, an elegant 656-page hardback by Oscar Trejo Zaragoza, playwright and Editorial Coordinator of Editorial Agata, which published the book. About 200 pages of this beautifully printed tome review the history of the Guadalajara Concerts Association, its ups and downs, challenges and solutions and the people in the background who made it all happen. This section contains hundreds of posters and photos—many in color—of world renowned artists such as Pablo Casals, Jaschi Heifetz, Claude Bolling, Andrés Segovia, Gary Karr, Narciso Yepes, Facundo Cabral, Benjamin Britten and many others of the outstanding musicians who were brought to Jalisco by the organization. The rest of the book is dedicated to Activities, in form of the most memorable programs of events occurring between 1951 and 2009. 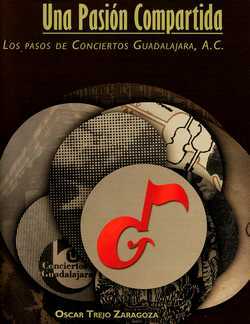 Conciertos Guadalajara was first known as La Sociedad de Conciertos y Amigos de la Música when it was founded in 1919 by local people enthusiastic about promoting the fine arts. Many of the events it sponsored over the decades have been free of charge, such as the international festivals held in the cathedral. The organization also presented free concerts outside Guadalajara with the proposal of bringing culture to every corner of the state. To help pay for such projects, they organized presentations by the extremely popular Vienna Boys’ Choir and the Rondalla de Saltillo students’ band. Supporting the efforts of Conciertos Guadalajara, says Trejo, “many musicians played in the city out of pure good will, charging not even 5 percent of what they would usually receive. Just one example is Mexican tenor Fernando de la Mora.” This explains how it was possible for Tapatíos to enjoy operas featuring Plácido Domingo for an entrance fee of only ten pesos. The fact that this book’s chronicle ends in 2009 tells us something. Is that when the Golden Age of music ended? 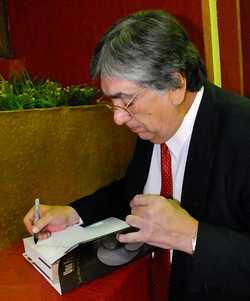 The University of Guadalajara’s Maestro José Manuel Jurado addressed this very question during the book launching. What does this monumental tome represent for Guadalajara’s music scene? Is it Mozart’s Requiem or Handel’s Hallelujah Chorus? Only time will tell. The auditorium was filled to overflowing.